"The baby was so newborn it didn't have blubber. It kept sinking, and the mother would raise it to the surface," he said Wednesday. Hanson said she looked thin and "clearly emaciated" when he and others observed from a boat Saturday near San Juan Island while collecting the whale's breath samples. 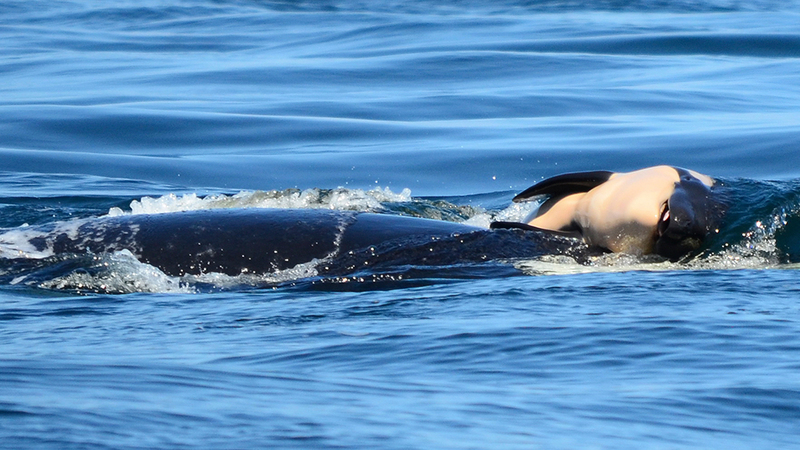 Another researcher, Deborah Giles, who was out studying the whales had alerted Hanson to a foul odor on the orca's breath, a smell detected on other orcas that later died. But the whale did not smell as bad on Saturday. "You could see the shape of her skull through her blubber," said Giles, a biologist with the UW Center for Conservation Biology. "I've never seen an animal this emaciated make it. But I'm hopeful that she will bounce back." "The death of the orca calf is a heartbreaking reminder of the urgency we face in saving these iconic animals," the governor's spokesman Jaime Smith wrote in an email. But Balcomb and others say more aggressive measures are needed. They have called for the removal of four dams on the Lower Snake River to restore salmon runs. "We have to address the issue of salmon restoration, wild salmon particularly," Balcomb said.